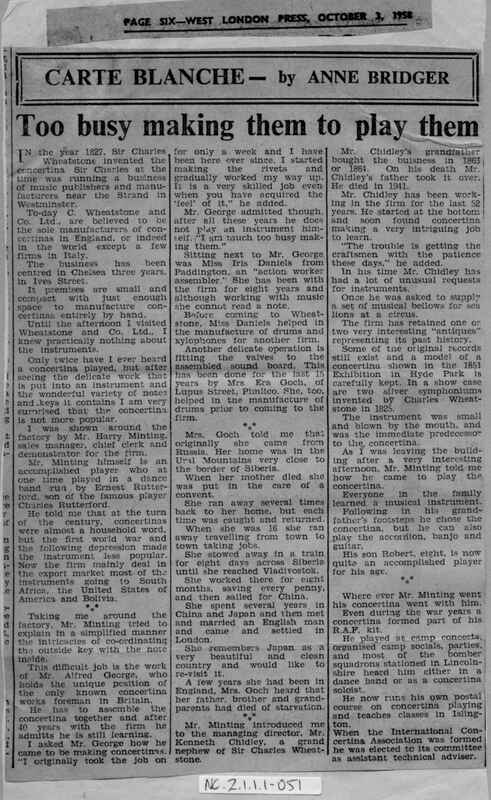 Full Description: A detailed press cutting from The West London Press of 3rd October 1958, publicising the concertina makers Wheatstone & Co and their Ives Street, Chelsea workshops. The text mentions Harry's career, some of the factory staff, and he introduces Kenneth Chidley and details the takeover of the firm by Chidley's grandfather in 1863 or 1864. The firm's collection of early instruments included two Symphoniums and one exhibited at the 1851 Great Exhibition.